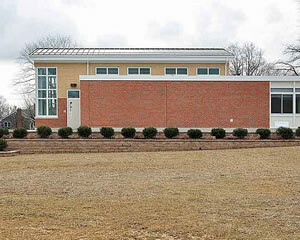 This project is the building addition portion of an addition/ alteration project at a neighborhood primary school on Long Island, in New York State. Its more unique origin is program-driven, not enrollment driven. 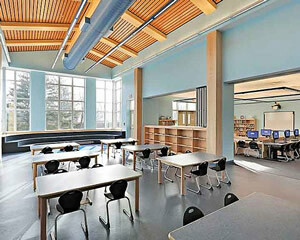 A main instructional space has been provided that can be used for library, art, music, or general instruction. There is an adjacent storage/support room for music and another for art – each to be opened and utilized while each program “has the floor”. There is an adjacent computer room for media as a solo function or for use in tandem with the whole area when it is used for library/media. Two operable partitions can be opened and closed as needed; one is full-height while the other sits atop a row of book stacks. A large bay window with built-in risers doubles as story sitting area and music stage/audience. Shelving units are located at the perimeter of the computer room as well as along the shared wall with the multi-purpose instructional space. Three-dimensional student art work can be displayed as well as books and other learning media within these units, that are not more than three shelves high. Students can contribute to the aesthetics of the room with their projects, and at the same time gain recognition for their efforts through the public exhibition of same. They can “connect” their own work and its display with the display of the work of professional authors and artists. This allows them to believe in an expanded future manifestation of their own creativity. 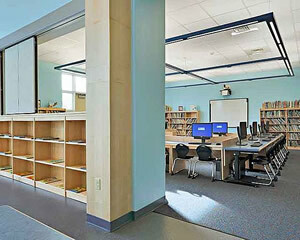 A carpeted sitting area is defined by the arrangement of computer desks oriented towards a Smart board for hands-on learning, creating yet another group environment as per the needs of the intended program. The arrangement of electrical boxes in the floor allow for multiple desk configurations. The new space can also inspire other activities beyond just ‘art’, ‘music’ and ‘library’. It is about “connecting the dots”, and seeing how different forms of artistic expression relate to one another. This assemblage of spaces creates a conducive environment for kids to put on “skits” about a book they may have just read, or sing a song from a book or video on a small stage – or draw a picture either manually or digitally at an art table or computer station. Students have unlimited opportunities to be creative through art media, musical expression, theater, and collaborative interaction in this space. It is a support vehicle for their continued expression and learning that involves sharing, creating, re-creating, and interpreting. 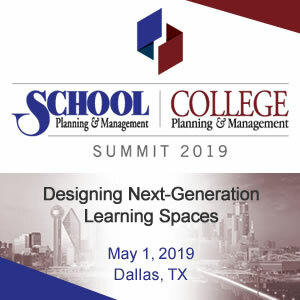 The practical design goal was to accommodate increased program scheduling opportunities without over-building. 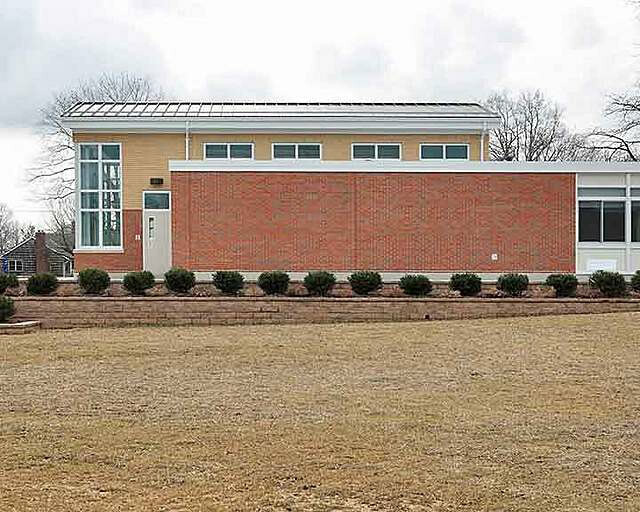 It was imperative within the context of an overall bond referendum that this addition be spare, since other primary schools within the same school district were not slated for expansion. In order to accomplish this, the design team effectively re-thought the traditional models of independently dedicated rooms for art, music, library, and computers, and instead created a series of overlapping learning environments that could be combined through both physical and scheduling parameters. We are using this model as a reference as we meet with school districts having programmatic needs in a difficult economy, so as to build less while still providing useful space. The design process was conducted through meetings with district administration, faculty and staff as well as at public meetings that engaged parents and community members’ participation with the Board of Education. Adjustments were also made based upon individual conversations with educators from each study area, so that the space would not compromise any one subject area. Each time a new facet was discovered through conversation, the whole composition was re-balanced so that all areas of student activity would still have an optimal environment in which to grow. 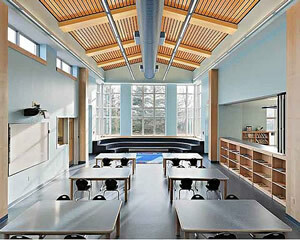 The aesthetic design goal was to create an engaging learning environment. 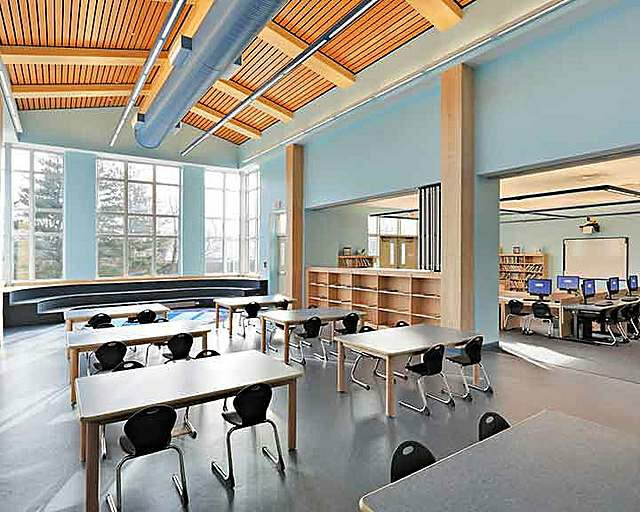 The abundance of natural light and use of light blue wall color prevent the interior from becoming overly serious or cumbersome, (it has after all been designed for primary school students). Views of the ever- changing sky and seasonal variations of local foliage are abundant from the many windows. Several exterior doors allow for ease of movement outdoors during good weather. 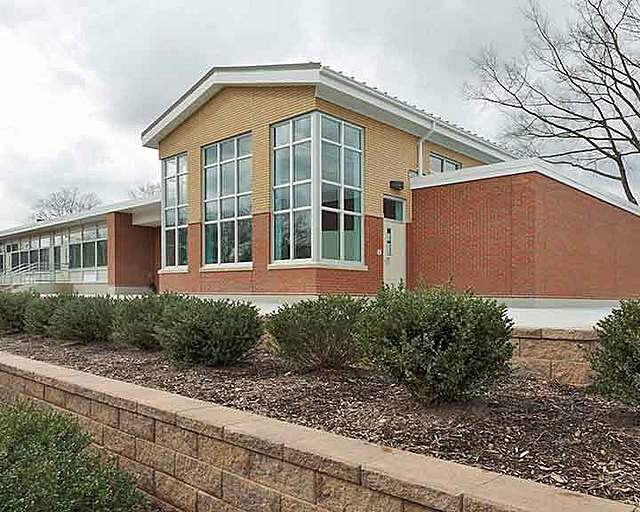 Several terraced gardens were created to bring the finished grade up to meet the new first floor elevation of the addition, and allow students access to outdoor learning environments. Future projects had been discussed that could engage students in nature activities within the new planting areas. The inspiration for the interior design approach was the openness yet “specialness” of a tree house environment; hence the use of natural maple on the ceiling and columns, the color palette, etc. (without becoming too literal). Rubber sheet flooring was used in the dual-use art and music space as the perfect combination of durability and maintainability, while also providing a sense of warmth and acoustical contribution. Carpet tile was used in the computer area for ease of maintainability and potential replacement without causing undo interruption. Physical architectural and engineering elements have been mixed with more virtual computer technology design and implementation to provide an educational environment supporting activities related to art, music, computers, literature, individual and group learning. 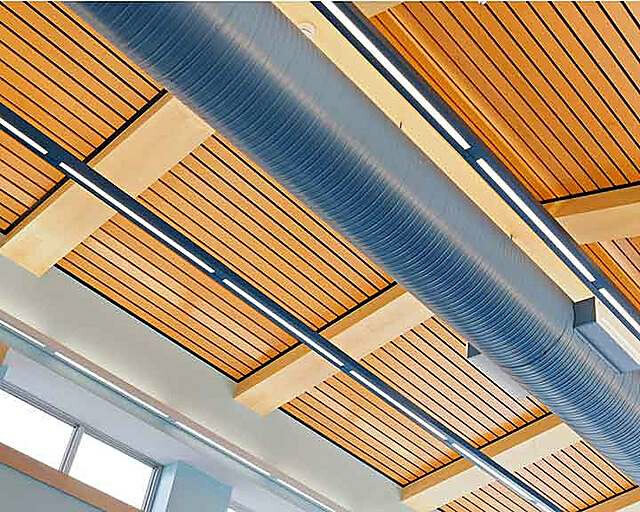 The exterior building envelope has been carefully detailed to easily maintain thermal comfort without incurring excessive energy costs. The HVAC ductwork has been expressed playfully and contributes to the aesthetics of the main space. Lighting fixtures located near windows have separate sensors so that they will not go on unless they are truly needed. Custom casework and furniture design and placement have allowed for greater efficiency and flexibility within the space. 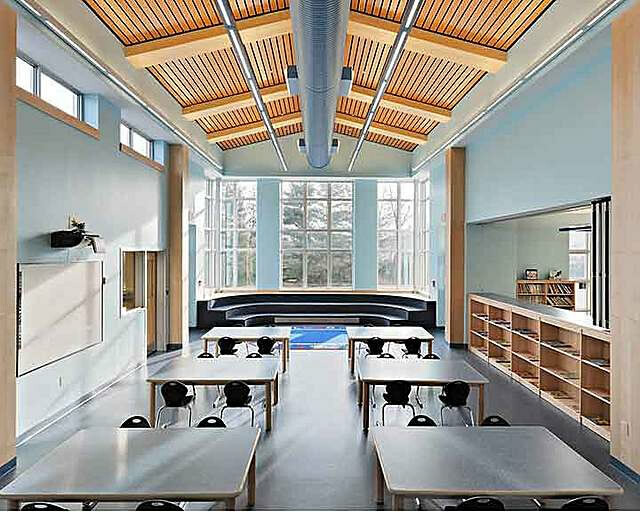 The interior design, architectural design, engineering, and sustainable approach all contribute to a lively, attractive and conducive environment for students. Their experience is enhanced by the physical environment – one that they will experience in different ways by the way and purpose for which they are using it throughout the day, week, and school year. In the end, the hope is that they feel safe, comfortable and therefore open to learning and sharing experiences with their classmates and mentors.